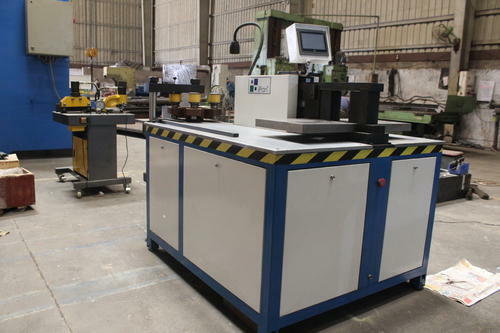 Product Description:In order to keep pace with the never ending demands of customers, we are involved into offering wide range of Busbar Bending, Cutting & Punching Machine. In order to keep pace with the never ending demands of customers, we are involved into offering wide range of Busbar Bending, Cutting & Punching Machine. We, iPan Machineries (India) Pvt. Ltd. have embarked on this domain in 2007 with achieving notable success in manufacturing and supplying the broad array of Hydraulic Machines. Our diverse product range includes Hydraulic Shearing Machine, Hydraulic NC Shearing Machines and Hydraulic Angle Shearing Machine. We serve to different sectors of the industry including machinery & machine tool manufacturers, power plants, automobile, aerospace, railways, and rubber engineering. We are envisioned as reliable firm realizing high-end innovative technology while accompanying elaborate fundamental postulates of precision engineering. Owing to this view, we have set breakthroughs with operative efficacy, endurance and accuracy of our products and have assembled large client base. Directed by strong technical excellence, we have generated cutting-edge infrastructure system for achieving maximal customer fulfillment by giving defect free products. Our production facility magnified with high-end machines and profitable production line has allowed us to impart excellent finishing and dimensional precision in our products. We make appropriate use of quality testing and a warehousing unit for ensuring quality deliverance of products. In addition to this, we have exercised punctilious experts who with their extensive adeptness of this field have bestowed us esteemed customers.